I haven’t been reading as much as I used to. My time is devoured by an increasingly busy day job, the lovely wife’s health issues, and making time to write. What’s left usually goes to either sleep or brain shut-down in front of the television set. When I have sat down to read, my patience is thin. Doorstop thrillers or fantasy novels are a no-go. A writer has a short window to grab me with something before I put down the book. Assuming the writer can pull that off, next comes the true test: can my attention be caught again after several days, maybe even a week between readings? But what if your biggest mistake was something you could never live down? Something so awful and despicable that it weighs daily on your soul? 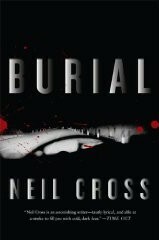 Carrying the book around wouldn't cause a hernia, and Burial is written by Neil Cross. Cross is probably best known to American audiences as the head writer of MI5 (Spooks in the UK) and the writer/creator of Luther. His novels are finally becoming more readily available in the US thanks to the popularity of his BBCAmerica vehicle with Idris Elba. At only $2 for a hardcover copy, it was no-brainer. When I started it that night after I got home from work, I thought had a made a mistake. The opening is almost all dialogue and the prose is typical, all tough-guy crime novel terse. I sighed, thinking it was going to read like a lengthy screen treatment. After the knock on the door, Cross takes us back to the beginning of Nathan's psychological hell and shows us the writing chops that make Luther one of the best shows on television: the prose style becomes focused and poetic, the dialogue spot-on, and the tension very real--growing not out of increasing violent confrontations or Bruckheimer showdowns, but understandable mistakes stemming from a fully-realized human being in awful circumstances. It was incredibly refreshing to read crime fiction that was character driven and about normal people, not cops and criminals or hitmen and junkies. Cross easily stood the time test and is now one of my go-to authors. You should give him a chance, maybe while you're waiting for the third and final series of Luther.